Twenty eight OMs celebrated 40 years (how did that happen – two score years!) since leaving QM at a special reunion tea held on 21 April 2018. The weather was perfect sunshine, and after the butterflies we all felt as we approached the front door, it was all excitement and squeals of delight at the recognition of ‘old’ friends. There was much laughter at shared memories of teachers, fellow pupils, and grey outer knickers (grey bags), which was the least-loved element of the School uniform. More laughter and giggles over a copy of the old School uniform list (dated 1971), a grey felt School hat, black and white photos and even piles of handwritten letters sent home each Sunday. The event was brought together through a handful of contacts and, as word passed around, the list of contacts grew and grew. 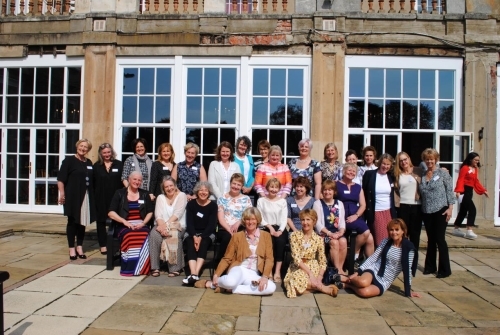 Girls travelled from Cornwall, Devon, Dorset, Sussex, London, the Midlands, Glasgow, Cumbria, Northumberland, Lancashire and others from all corners of Yorkshire! After a splendid tea, (which richly deserves its number one slot in Tatler), and a glass of fizz, we were given conducted tours around School by some charming, eloquent, friendly LVI girls. All are great ambassadors for the School. QM in many aspects remains the same as it was in the 70s – The Wenlock Library, Cloaks Corridor, the classroom at the top of Red Stairs (form room of IVR), and Red House for the Sixth Form. The Rotunda Dining Room opened in our final year at QM. However, the Art Block, Theatre, Chapel, Winnie’s, Cloisters and an indoor pool are all magnificent additions! Following our tour there was time for photos on Red Stairs and on the Terrace, and time for lots of hugs and goodbyes. On leaving the School what shines through is, that even after 40 years of life since QM, our friendships are everlasting. View photos from this reunion and more in the Events Gallery.